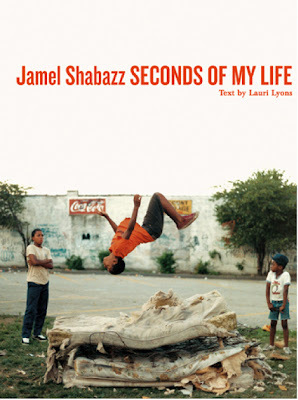 Seconds of My Life has the photography of Jamal Shabazz with text by Lauri Lyons. This book is basically a scrapbook of pictures that Jamal Shabazz has taken over his life. It has photos starting from the 1980's, when Hip Hop was becoming popular in music up until the new Millennium. This book truly captures New York City and Brooklyn through years of new fashion and new phases of music. In the 1980 section, we see our modern day Brooklyn, pushed back through time. The fashion, the lifestyles, the hair, are different. We see people dancing, posing, in cars, in the streets, gang members and even the subway system, when it was more littered with graffiti art. In the 1990's section (entitled: A Time of Change), we see what a difference a decade makes. Even though we're in the same settings: the parks, the subways and Union Square, the fashion has changed. Men now have Afros and their pants have become more baggy and lower. Women are now wearing small tight "bootylicious" skirts and shorts. We see breaking battles in the street, even down to their single piece of cardboard and overly huge boomboxes. We see the death over Tupac, Biggie, and Big Pun. He also captures Puff Daddy's club scandal. We now see graffiti art becoming a little more mural like, instead of a signature. Even the music scene has grown showing kids involved in school programs. Capturing bits of pieces of not only his life, but all the people around him. As we hit Y2K and beyond (2000-2007), he hits the school scene with school bands and dance teams. He also, once again, has capture the change in fashion where we see velor track suits. He also touches on the ethnicity side of the city focusing on Native American traditions, African traditions and even a little Puerto Rican Pride Parade. We see children being children, playing in the streets and having fun together. The graffiti art is now full blown works of art, showing portraits of celebrities. The music and the culture have combined as one to form this great city. At the end, he captures true photos on the day that will not be forgotten in this country, September 11, 2001. There is one photo over all, that captures it all called "At A Loss". This photo is a shot of volunteers, fireman, and policemen cleaning up the aftermath with one fireman in the front, gazing over the mess. In this piece you can hear the silence of the city, even though people are working. You can breathe the dust from the debris. Pictures of the newspapers and the protesters against the war, showing even a sad clown holding a banner that says "Study War No More". A mother with a folded American Flag to show her child's death in, "How Many More Must Die?" This book truly captures the essence and culture of New York City. Oh my goodness Kaitlyn, I'll tell my people how much you liked it!